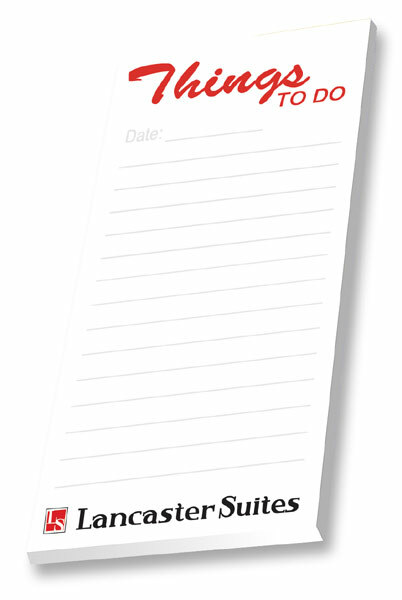 Adhesive 3" x 8" - 50 Sheet Note Pad will improve everyones efficiency. To create a special pad use Things To Do, Shopping List, Remember List, etc.at the top of the pad and put your logo on every page at the bottom for extra exposure. Request ruled lines to expand the opportunities of this pad. Bulk / 11 lbs. lbs / 60 pcs. Price includes a FREE 4-color process imprint! 4-color process allows you to print as many different colors as you want for one price! All PMS colors will be converted to the closest 4-color process match. A perfect match cannot be guaranteed. Imprint Area: 2 5/8" x 7 5/8"